Today is Google's 12th Birthday. 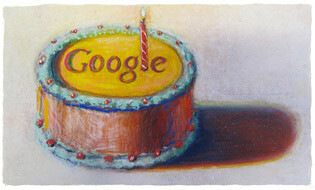 They have a special Google Doodle or logo made by Wayne Thiebaud, a well known painter known for painting cakes. Thiebaud was born on November 15, 1920, in less than 2 months he turns 90. You can see Google's past birthday logos for their 11th birthday, the 10th also, 9th, 8th, the 7th and 6th. The 7th and 6th were celebrated on different days than the later ones, due to there being confusion on when Google's real birthday is. Forum discussion at DigitalPoint Forums, Google Blogoscoped Forums, Google Web Search Help.